Vortex Science, Scalar Wave Energy, and Hyper-Dimensional Action. THE QS-12 IS OUR MOST POPULAR, VERSATILE, AND POWERFUL UNIT! 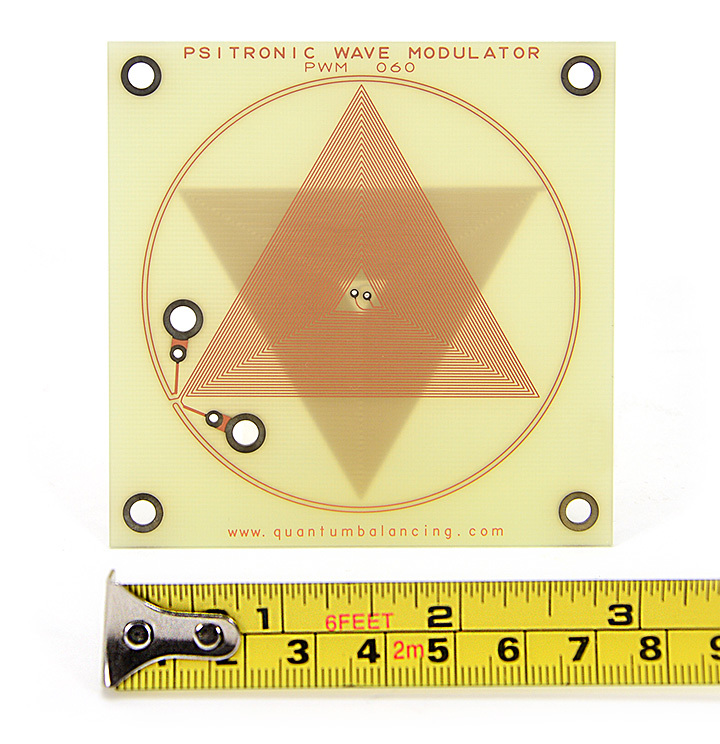 DESCRIPTION: This is our brand new QS-12 designed to take an input signal from your source device (such as iPods, Smartphones, MP3 and CD Players and others listed below) and channel it through the precisely-designed, geometrically-coherent pattern. The input signal will follow a complex current path of layers and angles which form nodes or vortex points (tiny tornadoes) designed to greatly enhance whatever you are playing through your source device. The QS-12 is a powerful Imprinting Plate and Silent Broadcasting Device (SBD), made simple to use. As the input signal travels from your source device through the geometrically designed circuitry of the QS-12, the signal oscillates at numerous frequencies simultaneously and is multiplied as a result of the vortex action at the node points (where the copper tracings intersect each other on all four layers). Fortunately, the resulting frequencies and harmonics are not audible; instead, they are silently broadcast as harmonious energy to the surrounding environment. 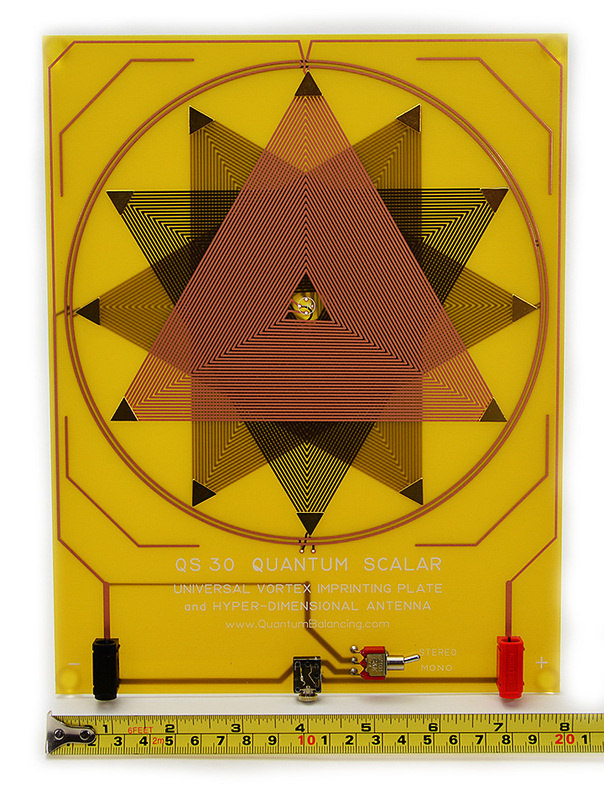 The QS-12 includes 12 precisely-placed, gold-plated, high-power, neodymium magnets on the surface of the geometric array which greatly amplify the broadcasting capability of this design. The 12 magnets are carefully polarized with the negative north (-N) side of the magnets facing up. TO USE: The QS-12 has 2 sets of connectors on the face and using either Set 1 or Set 2 will imprint or broadcast the harmonic frequency patterns generated by your source device. Set 1 (black jack and red switch at the bottom center) receives a male connector from your source device and the switch selects stereo or mono mode; Set 2 (black banana jack at bottom left and red banana jack at bottom right) receives 2 male connectors from your source device. Set 1 is a standard 3.5mm jack which can be switched to either stereo or mono operation. When the mode switch is set to STEREO, it universally connects to the headphone or output jack of iPods, Smartphones, MP3 or CD players, and Notebook and Desktop Computers. When the mode switch is set to MONO it connects to mono devices such as radionic machines, homeopathic imprinters, homeopathic remedy makers, and many frequency instruments such as the F165. Set 2 has two standard banana jacks for easy connection to many frequency instruments which use banana plug output connectors such as the GB-4000 and SR-4 Amplifier. HOW OUR CUSTOMERS ARE USING IT: 1) SILENT BROADCASTING: Plug the QS-12 into a source device (iPod, Smartphone, MP3 or CD Player, PC or Mac Computer) to silently broadcast Hertz frequencies of music, tones, and other sounds. 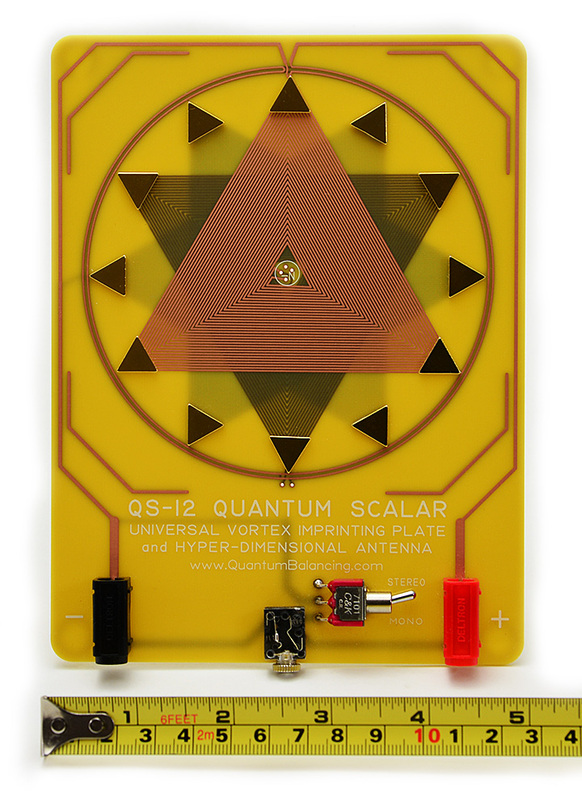 2) IMPRINTING: Plug the QS-12 into a source device (iPod, Smartphone, MP3 or CD Player, frequency generator, or homeopathic remedy maker) and place objects to be imprinted (a glass of water, jewelry) in the center array of the QS-12, and imprint with your source device for at least 5 minutes. 3) BOOSTING: Plug the QS-12 into a source device (iPod, Smartphone, MP3 or CD Player, frequency generator, radionic instrument, or homeopathic remedy maker) and place objects to be boosted (vitamins, supplements, food, homeopathic remedies and tinctures), and boost with your source device for at least 5 minutes. 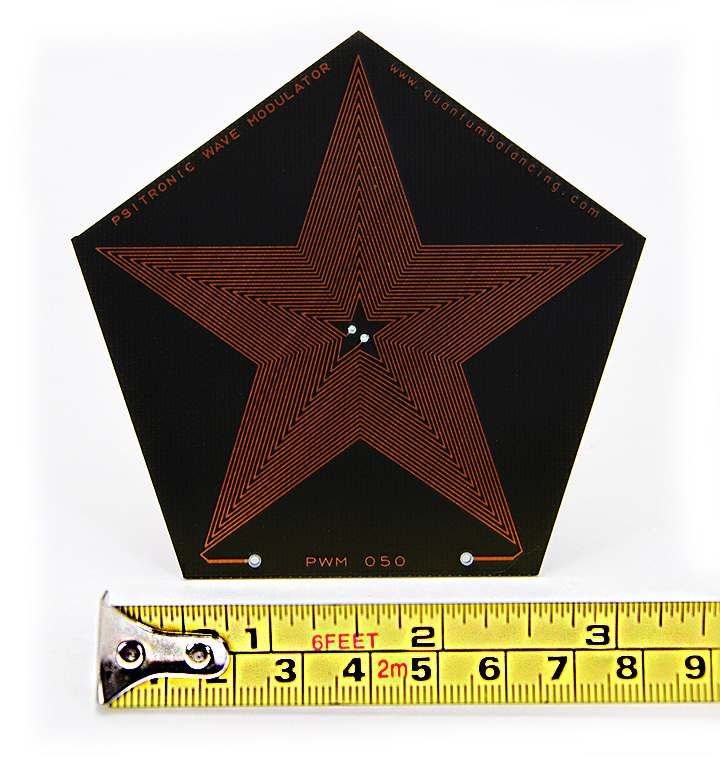 This is the largest and most powerful Universal Vortex Imprinting Plate and Hyper-Dimensional Antenna. It has been designed with extra-wide copper tracings to make it capable of handling more power. It is both stand-alone and universally device connectable to most any source with a standard 3.5mm output jack. It connects easily to CD players, iPods, mp3 players, notebook and desktop computers, radionic instruments, homeopathic imprinters, homeopathic remedy makers, and frequency instruments such as the GB-4000. This is a Silent Frequency and Music Broadcasting Plate and Hyper-Dimensional Antenna that is small, portable, novel, and easy to use. Mounted to the top side is a standard 3.5 mm output jack, which makes it universally connectable to most any audio source (CD players, iPods, MP3 Players, and Smartphones). It also connects easily to notebook and desktop computers, radionic instruments, homeopathic imprinters, homeopathic remedy makers, and frequency instruments such as the GB-4000. The SFBP does silent music music broadcasting and silent frequency broadcasting. It works especially well with all types of music, sounds of nature and especially subliminal recordings. The radius of broadcast is approximately 45 feet when connected to higher power stereo equipment (such as a home stereo system) and desktop PCs (Windows or Mac) with amplified speakers. The radius of broadcast is approximately 5 feet when connected to smaller portable devices such as iPods (iPod not included) and MP3 players. 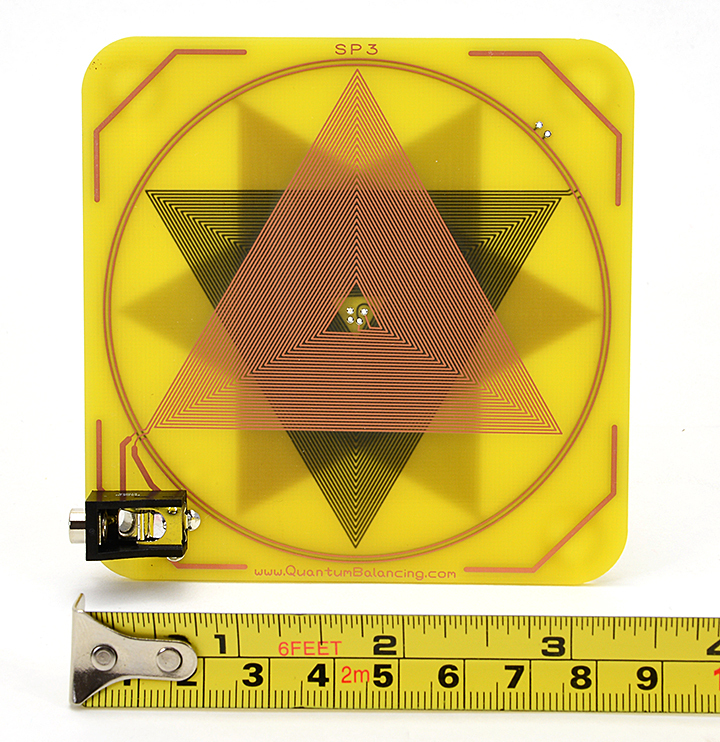 This is a Vortex Imprinting Plate and Hyper-Dimensional Antenna that is both stand alone and device-connectable. The SP-3 is one of our most powerful and popular compact designs. It is a Silent Broadcasting Device. 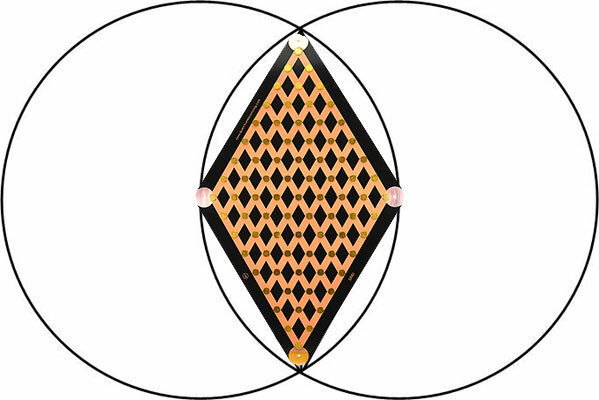 It incorporates incredibly detailed and complex circuitry to produce vortex energy as the energy passes through 4 layers of equilateral triangles forming 12 divisions. These precise geometrical pathways produce millions of miniature energetic vortices. Mounted to the top side is a standard 3.5 mm output jack which connects to most any audio source. 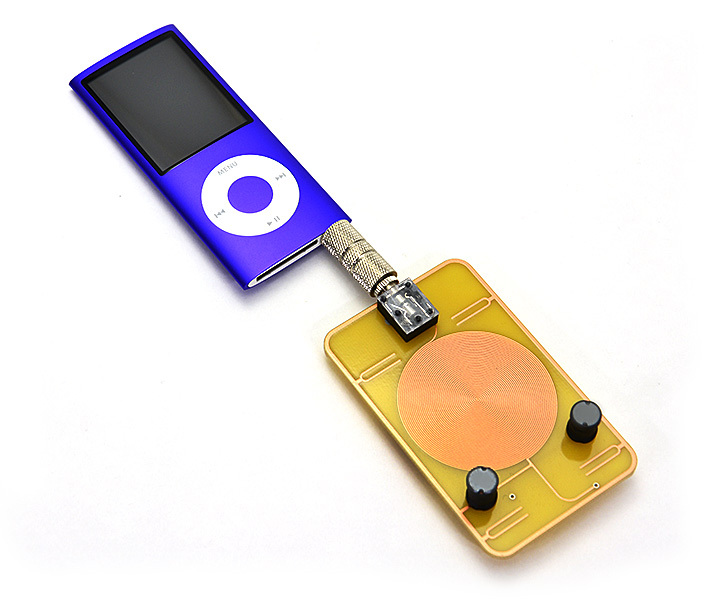 It connects easily to CD players, iPods, mp3 players, notebook and desktop computers, radionic instruments, homeopathic imprinters, homeopathic remedy makers, and frequency instruments such as the GB-4000. 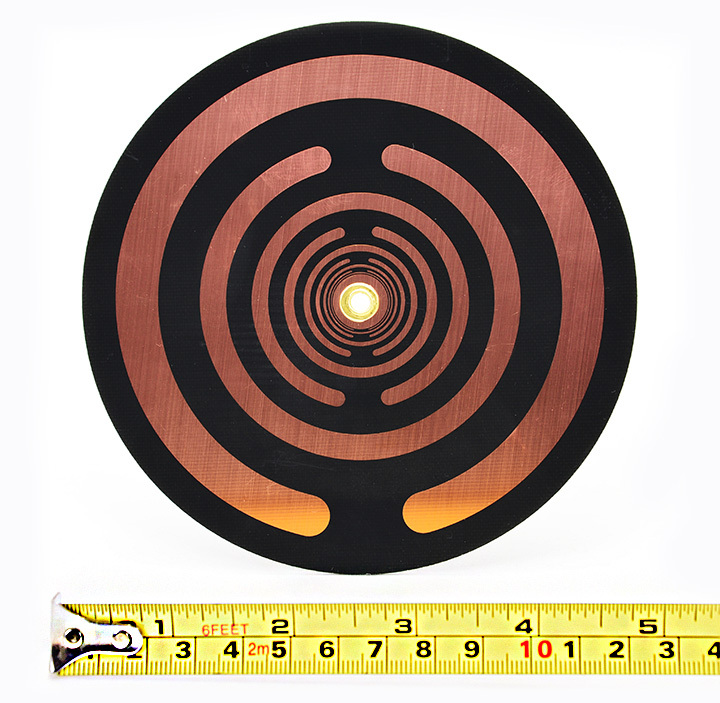 This unique toroidal design incorporates the most powerful spiraling vortex based mathematics principals. This design is truly the template of our universe and the energetic essence of creation. 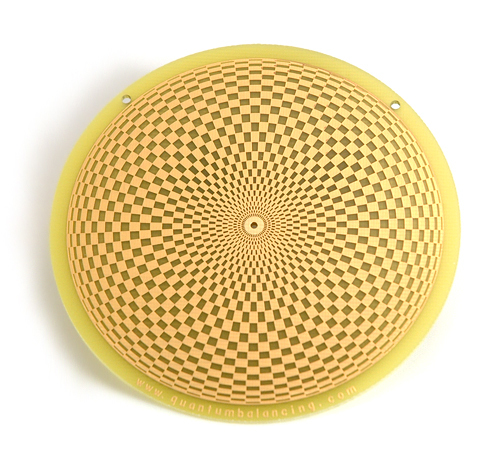 This powerful totoidal symbol of nuclear evolution was used by Dr. Christopher Hills in the 1970's and 1980's for his experimental work in dowsing, radionics, and supersensonics as shown by the symbols to the right. You can read more about this powerful symbol in the books "Nuclear Evolution Discovery of the Rainbow Body" and "Supersensonics" by Dr. Christopher Hills. This is a Vortex Imprinting Plate and Scalar Wave Antenna. The PWM-060 is both stand alone and universally device-connectable. The PWM-060 does not have a 3.5 mm output jack on the board so connecting wires must be soldered to the board by the end user. CONNECTS TO: CD players, iPods, MP3 Players, and Smartphones. It also connects easily to notebook and desktop computers, radionic instruments, homeopathic imprinters, homeopathic remedy makers, and frequency instruments such as the GB-4000. This is a Vortex Imprinting Plate and Scalar Wave Antenna. The PWM-050 is both stand alone and universally device-connectable. 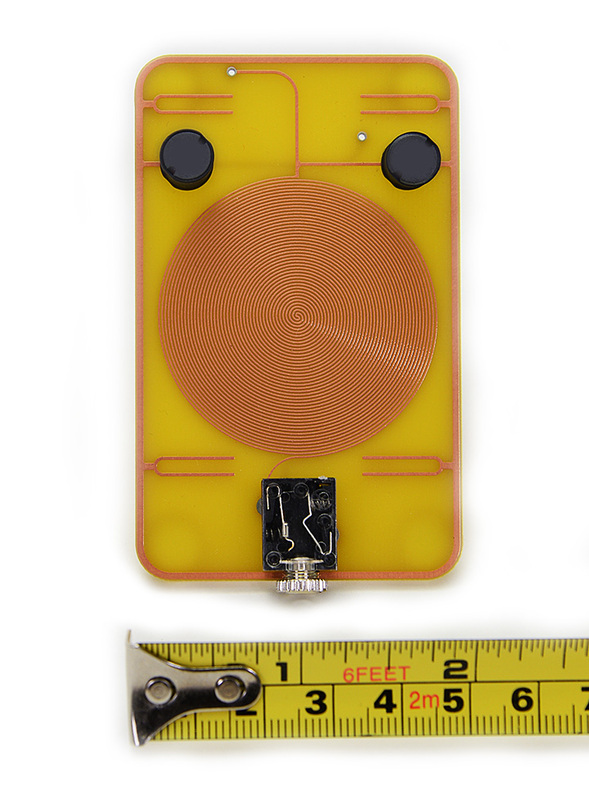 The PWM-050 does not have a 3.5 mm output jack on the board so connecting wires must be soldered to the board by the end user. USEFUL FOR: Pyramid Energy experiments or building your own Christopher Hills Pi-Ray Coffer. 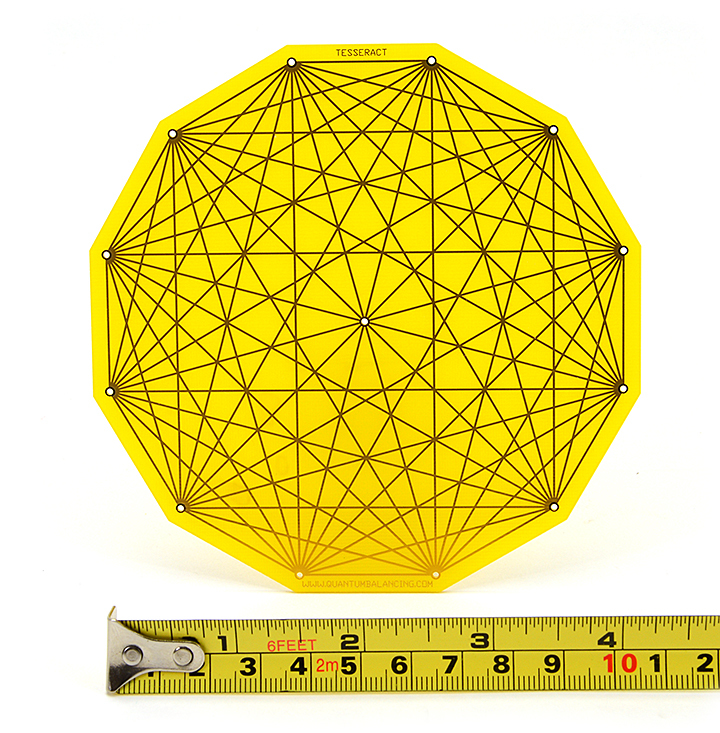 This is a Tesseract Energy Plate. The Tesseract is a very powerful design for energy experimentation made popular in the classic book Shape Power by Dan Davidson. 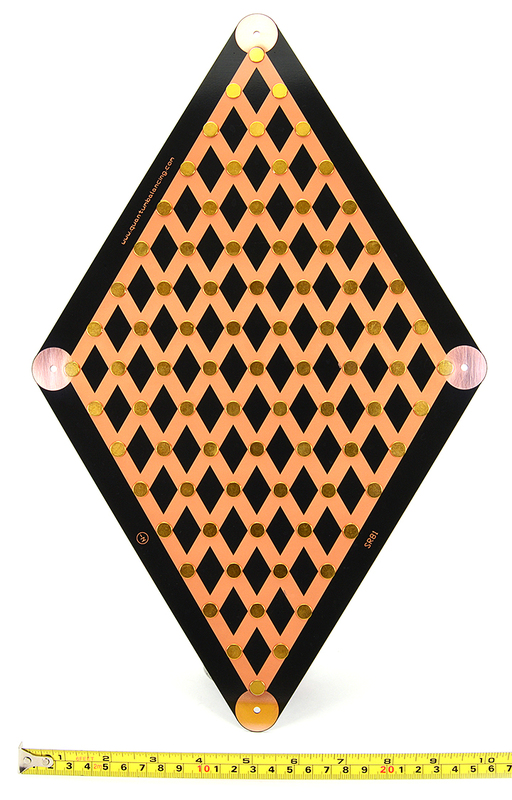 CONNECTS TO: certain radionic devices by connecting the output of the radionic instrument to the center connecting hole on the Tesseract Plate. Also ideal for placement under massage tables and meditation mats. 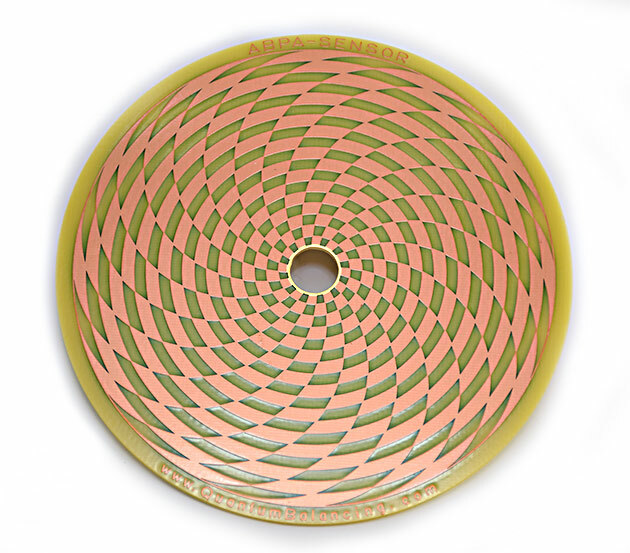 This is a Vesica Piscus Energy Plate featuring a beautiful and functional Vesica design and 81 gold-plated, neodymium magnets, precisely placed at the optimum vortex energy points. The magnets are all polarized with the NEGATIVE NORTH (-N) side facing up. CONNECTS TO: a variety of devices like the Lee Crock Energy Cleaner and may be used to build an enhanced version of the popular Eeman Bio Relaxation Circuit. Also ideal for stand-alone placement under massage tables, meditation mats, and charging food and water by placing opjects to be charged on the surface of the plate. 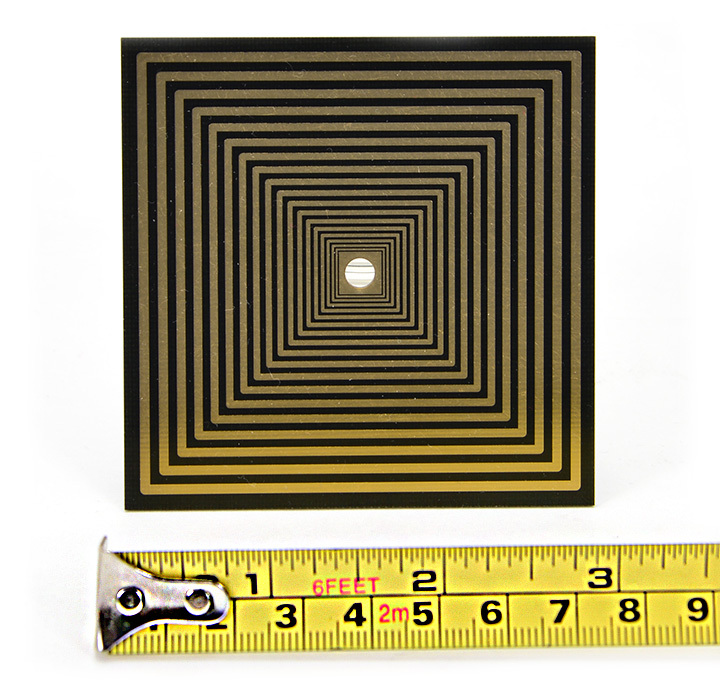 This is a compact sized Lakhovsky Multi Wave Oscillator Antenna designed precisely to Golden Ratio proportions. PLUGS INTO: Lakhovsky Multi Wave Oscillator instruments and devices. Can also be used with many other high voltage Tesla-type devices. 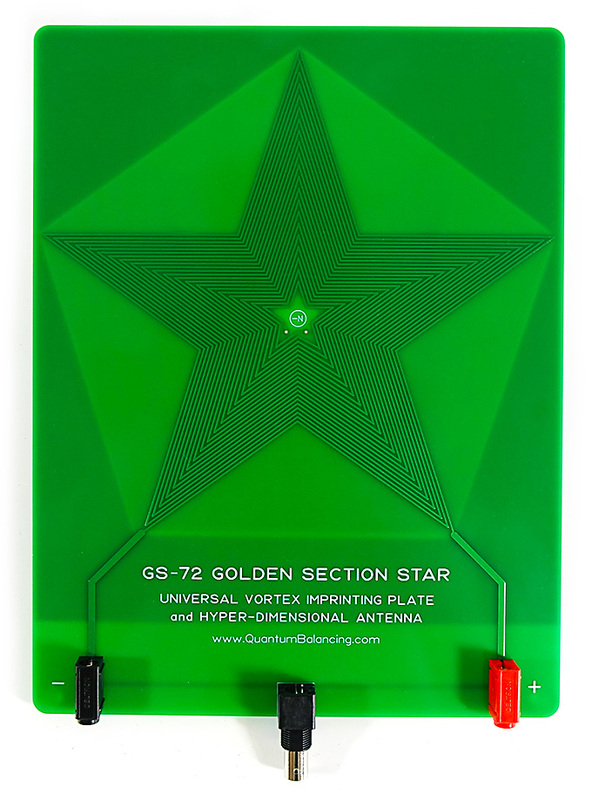 This is the new 2019 GS-72 Vortex Imprinting Plate and Scalar Wave Antenna designed specifically for the GB-4000 and other frequency generators. The GS-72 is universally device-connectable using either a standard BNC connector or banana plugs. Mounted to the top side is a standard BNC connector, which makes it universally connectable to most any audio source. The GS-72 is not for sale individually but only available as part of the GB-4000 Professional Package. NEW BNC CONNECTOR PLUGS INTO: most modern frequency instruments such as the GB-4000, F-165 and many others. The GS-72 can also connect to many frequency instruments using the attached banana plug jacks. Copyright © 1996-2019 EMR Labs, LLC. All rights reserved. Void Where Prohibited.